I'm first!!!! I've never made it first before, I made short work of this. Can't wait to see your takes! this photo made me feel very uncomfortable. Yes, Kay, me too....I want to scream at that woman to get out of that sociopath's tub and run, run, run....plus how weird is it that Hitler had a photo of himself framed and in his bath tub? I am surprised at the image too but it's a fascinating image all the same. I'm surprised he didn't have a picture of his beloved dog in the room! "Chilling" is the first word I think of when viewing this weeks prompt. And how could she? Woo hoo! Still happy to be first once. Hugs! How could she take a bath in "that?" It's a sensitive subject but I think this week is very interesting and seeing what each of you write is very telling. I think she and Scherman were probably in shock and the response was what we see today, as inappropriate. She hit the bottle in later life and was diagnosed as being clinically depressed. What we now call Post Stress Syndrome. Her photograph for Vogue of those innocents who died was not her only shocking photograph. She also photographed dying children in a Vienna Hospital, peasant life in post-war Hungary, and the execution of Prime Minister László Bárdossy. She seemed to have a knack for the uncanny. Really looking forward to the Mags. I like a bit of controversy. and humour! 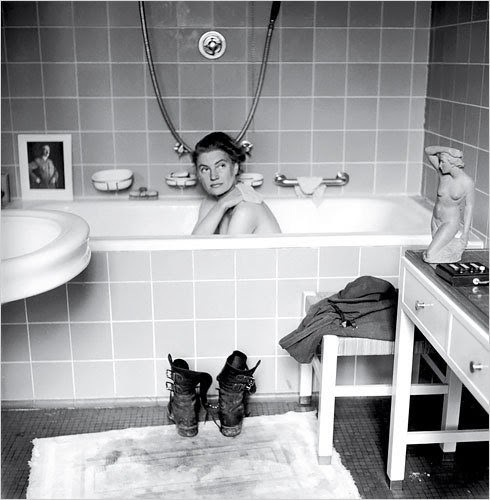 I have seen this photo many times and I keep wondering why someone would wish to bathe in Hitler's tub. Truly a Mag week for the records most unusual. I'm looking forward to next week's now! I seriously had to work to get over the "what the hell am I looking at?" factor. The clown face from last week was less creepy. Maybe we should be afraid of next Sunday's prompt? Haha! Oh my goodness, I'm wondering that myself! lol....ladies I'm sure Tess's next prompt will be fine. I think it's simply a case of how the author wants to perceive the picture, any background information doesn't have to be incorporated into the piece, as some entries above have shown. All in all, I find Magpie Tales to be both educational and inspiring. You can't fault her variety, we won't have to brace ourselves too much! Me, too! I don't normally look into the story of the picture prompt if I'm not familiar with it but for some reason I did this week. With me I usually go with the very first thought and stick to it.. I guess that's the attraction of what MT draws out of you. Well before I read anything I saw that Hitler picture on the tub. Hahaha! See you on Sunday. Mine is up. A little on the macabre side I'd say! I got kinda sassy with this one. Where is the prompt this week I hope you are okay Tess! Really miss the prompt. Hope you're well. She's very well. The lady went travelling!! That is good to know thanks Blog of Bee I was worried, as I'm sure many were! Enjoy your travels Tess! TY Blog Of Bee for relieving my mind. I can stop checking for the prompt! Whew!